It’s important to remember that FLVS was created to provide flexibility and offer open enrollment to students around the state. We must continue to protect this mission and not allow policies to chip away at the flexibility that FLVS allows students. We were built to help students accelerate as well as give them the flexibility to take the extra time they need to succeed. This model has been proven over and over as our exam scores continue to outpace the state averages and student survey results show that most students use FLVS to graduate early or on time – now that’s impressive! Imagine if this choice did not exist for students. 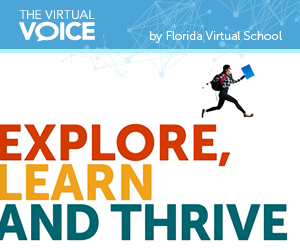 Please take a moment to thank your local legislator for creating and continuing to support Florida Virtual School. You can find contact info for your legislators at www.myfloridahouse.gov and www.flsenate.gov. This entry was posted in Parent Edition and tagged Education Legislation, Flexibility, Freedom, Legislation, Legislative Updates, Reaching Students, Student Achievement, Student choice, Student Success, Student Support, Student Voice on April 17, 2015 by Holly Sagues.